I just received my 9 super samples of the new Platinum Mix Free line. I thought you all might want to see the swabs. I haven’t played around with the inks yet, but I will definitely put up some reviews as soon as I have formed opinions of them. Smoke Black is a rather average black. Earth Brown is a reddish-brown. It is very similar to J. Herbin Cafe des Iles. Aurora Blue is one of my favorite. It is very similar to Diamine Sapphire Blue. Aqua Blue is a nice turquoise blue. 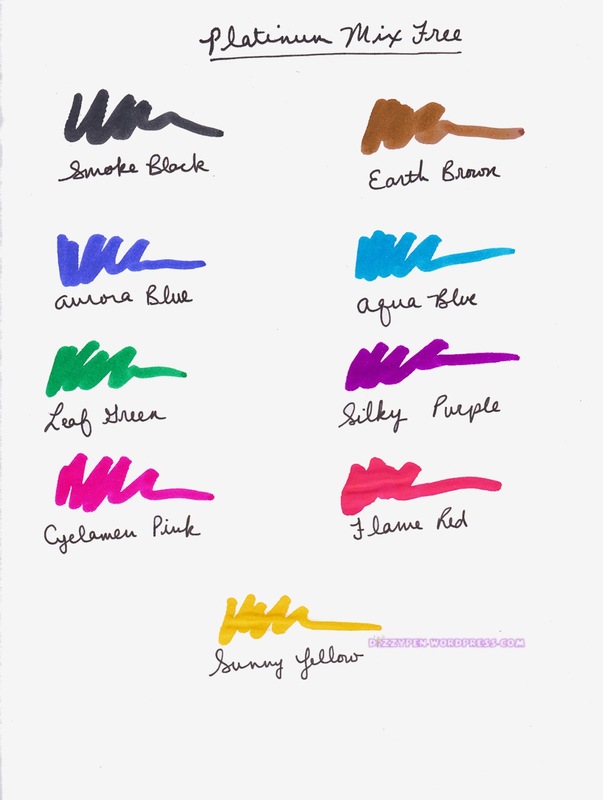 It is very similar to J. Herbin Blue Prevenche. Leaf Green is also a nice green color. It reminds me a bit of J. Herbin Lierre Sauvage. Silky Purple is definitely my favorite color of all these, and it is nearly identical to J. Herbin Rose Cyclamen. It’s very bright and a very red purple. Cyclamen Pink is nearly identical to the long since discontinued Levenger Pinkly. Flame Red is nearly identical to Noodler’s Dragon’s Napalm. Sunny Yellow is a fantastically rich yellow. ISellPens.com sells a sampler for $20. In their kit you get a 10ml sample of each 9 colors of Mix Free inks, 2 extra bottles, and 2 ink syringes. This is where I purchased my kit. GouletPens.com sells a sampler for $30. In their kit you get a 5ml sample of each of the 9 Platinum Mix-Free fountain pen ink colors in labeled plastic vials, a Goulet ink syringe set, and ten empty ink vials. PearTreePens.com sells a sampler for $29.95. In their kit you get one 5mL sample of each of the 9 specially designed colors, one Write-Fill Kit, an empty full-sized ink bottle (of their choice), and three empty sample bottles. There are several places you can get full bottles of Platinum Mix Free inks. Individual bottles are around $20 each. Many places are selling full-sized sets of all 9 inks for $149.